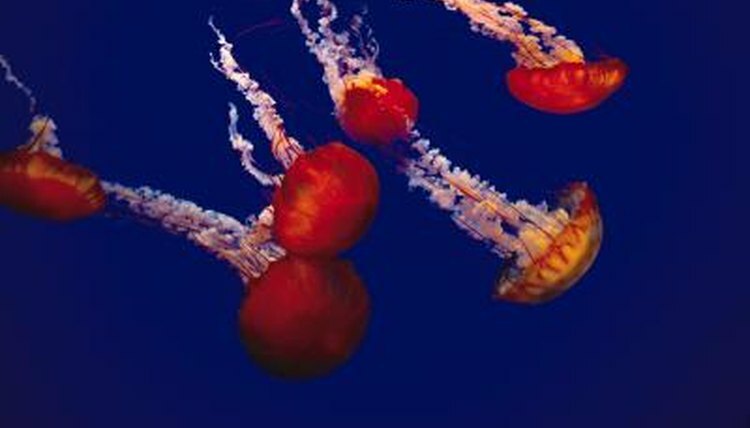 The sea nettle is actually a genus, or category, of jellyfish. Specifically, the sea nettles include members of the genus Chrysaora. The compass jellyfish (C. hysoscella) and the Pacific sea nettle (C. fuscescens) both belong to this genus, which has several distinctive characteristics. Most sea nettles have a standard Medusa body type with a "bell" or round body and tentacles hanging from the bell. In the sea nettle, the bell may grow up to a foot across and the tentacles may reach a length of 10 meters, depending on the species. The bells of the sea nettles often have warm colors, including yellows and oranges. The compass jellyfish, a specific type of sea nettle, has dark stripes radiating from the center of its bell, giving it a compass-like appearance. Sea nettles have an Indo-Pacific range, meaning they live in the Indian and Pacific oceans. This range includes countries like the Philippines, Japan and the west coast of the United States. Sea nettles live a pelagic lifestyle, drifting in the open ocean. Sea nettles use light-sensitive cells to migrate upward in the water column during the day, then sink into deeper water at night. Sea nettles occupy a distinctive spot in the ocean's food web. They feed on other planktonic animals. This includes free-swimning worms like the arrowworms (Sagitta) and segmented worms (Tomopteris spp). They also feed on comb jellies, organisms that resemble jellyfish. Despite sea nettles' defenses, many animals prey on them, including sea turtles, tuna, sunfish, some species of butterflyfish and the spiny dogfish. The sea nettle hunts its prey with stinging cells called cnidocytes. These pierce the skin and inject poison into their prey. The sting of the sea nettle is not usually dangerous to humans, though it can be painful. However, some people have an allergy to the venom and can suffer serious reactions from it. Some animals, like the predators of the sea nettle, are completely immune to the venom.